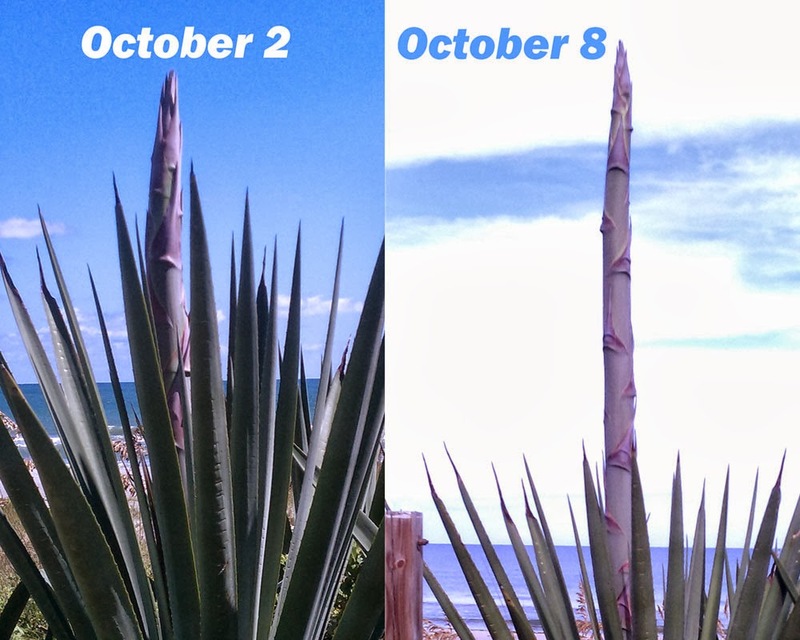 I had to repost the pic of the flowering Spanish Bayonet in my backyard. 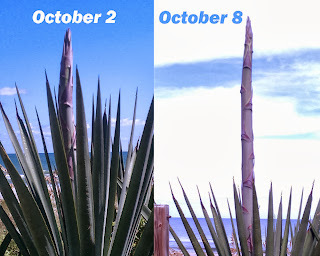 The speed at which the flower spike is growing is incredible. It's averaging around a foot a day. The number of property sales in September in Cocoa Beach and Cape Canaveral was less than in any of the summer months but still exceeded any September since 2005. There were 49 closed condos and 6 single family homes. October has begun slower yet with only 13 closed condos and townhomes recorded as of this morning. Sales have ranged from $240,000 for a top floor south ocean view Sandcastles furnished 2/2 with garage to $66,000 for a small Cape Canaveral townhome. Listing inventory remains at a severely depleted level and decent properties that are priced right are scarce. Buyers in this environment must be patient and expect competition for the good new listings. As usual in October, our streets and restaurants are pleasantly uncrowded and the air temps have cooled below the 90s. The water temp in the surf is still in the low 80s and we've enjoyed a persistent small swell for weeks. A few advance scouts for the gathering hoards of snowbirds north of the Mason-Dixon have been spotted although the full invasion is still a couple months off. It's a good time to be in Cocoa Beach.